Dr. Eric D. Freeman is the medical director and founder of the Redefine Healthcare; previously known as Freeman Spine & Pain Institute. He is board certified and fellowship trained in Interventional Spine and Pain Management, as well as Physical Medicine and Rehabilitation. 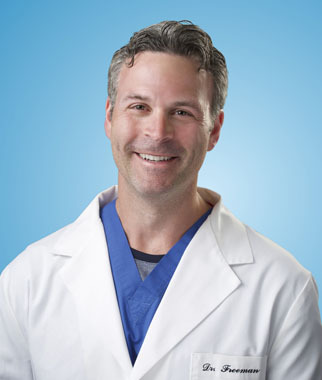 Dr. Freeman specializes in minimally-invasive spinal procedures as well as non-surgical orthopedic care. His expertise is in treating patients with all types of pain conditions with a focus on spine disorders, degenerative and herniated discs as well as arthritic joints and sport medicine injuries. Dr. Freeman is a fellow of the American Academy of Physical Medicine and Rehabilitation and Interventional Pain Practice and is the Immediate Past President of the New Jersey Society of Interventional Pain Physicians. He continues to be at the forefront in the treatment of all spine and pain disorders and attends, as well as conducts, numerous seminars in the field of Interventional Pain Management and Minimally-Invasive Spine Techniques. Dr. Freeman is well recognized in the field of pain management being listed as one of “America’s Top Physicians”. He is also involved in the education of other physicians, performing lectures and publishing textbook chapters for Board Certification testing. Dr. Freeman has dedicated his life’s work to providing his patients with the most comprehensive state-of-the-art care presenting them with the best opportunity to live an active lifestyle, pain free. Pain Medicine Symposium 2016.: Evolving Advanced Pain Therapies, Jersey City, NJ, October 26 – 29, 2017. Pain Medicine Symposium 2016.: Evolving Advanced Pain Therapies, Jersey City, NJ, November 3 – 6, 2016. ASIPP 18th Annual Meeting, Dallas, TX April 15 – 17, 2016. Pain Medicine Symposium. NY/NJSIPP, Jersey City, NJ, November 6 – 8, 2015. 23rd Annual Scientific Meeting. International Spinal Intervention Society (SIS), Las Vegas, NV, July 28 – Aug 1, 2015. 2014 Regenerative Medicine (STREAM): Current Concepts in the Treatment of Musculoskeletal Conditions (AAPM&R) November 12, 2014. Evolving Advanced Pain Therapies. NY/NJ SIPP: Pain Medicine Symposium, Jersey City, NJ, November 6, 2014. TOBI 5th Annual PRP & Regenerative Medicine Symposium with Cadaver Lab, Foundation for Care Management, Las Vegas, NV, June 2014. Level Two — Advanced Ultrasound Training in Pain Medicine, American Academy of Pain Management in Ultranogrophy, Atlanta, GA, March 2014. Bio-Cellular Regenerative Injection Therapy: PRP/Adipose-Derived with PRP/Bone Marrow Concentrate with PRP, Fort Myers, FL, October 2013. Vertebral Augmentation Physician Certification. Kyphone, Jersey City, NJ, September 2013. Level 1– Intro to Ultrasound for Pain Medicine, American Academy of Pain Management in Ultrasound, Sept 2013. 21st Annual Scientific Meeting. International Spinal Injection Society (SIS), New York, NY, July 2013. Ultrasound for the Spine Practioner. International Spinal Injection Society (SIS), New York, NY, July 2013. Evolving Advanced Pain Therapies. NY/NJ SIPP: Pain Management Symposium, Jersey City, NJ, October 2012. 20th Annual Scientific Meeting. International Spinal Injection Society, (SIS), Las Vegas, NV, July 2012. 14th Annual Scientific Meeting. American Society of Interventional Pain Physicians (ASIPP), Arlington, Virginia, June 2012. 19th Annual Scientific Meeting. International Spinal Injection Society (SIS), Chicago, IL, August 2011. 13th Annual Meeting. American Society of Interventional Pain Physicians (ASIPP), Washington, DC, June 2011. Advanced Intensive Procedures. International Spinal Injection Society (SIS), Memphis, TN, August 2009. 17th Annual Scientific Meeting. Interventional Spinal Intervention Society (SIS), Toronto, CA, July 2009. 22nd Annual International Intradiscal Therapy Society Conference and Scientific Program, Scottsdale, Arizona, May 21-23, 2009. ISIS: Intensive Anatomy & Imaging Workshop: University of New England, May 1-3, 2009. Vertos Medical: Minimally Invasive Lumbar Decompression, Cares-St. Peters Hospital, 3-21-09. TruFuse Surgical Training, Cares-St. Peters Hospital, September 13, 2008. Endoscopic Spine Surgery, North Jersey Surgery Center, April 26, 2008.
International Spinal Intervention Society (ISIS) 15th Annual Scientific Workshop: Back to Basics, Baltimore, MD 2007. American Academy of Anti-Aging Medicine: 14th Annual International Congress of Anti-aging Medicine and Regenerative Biomedical Technologies, 2006. Managing Chronic Pain-Spinal Cord Stimulation, New Brunswick, NJ, 2006.
International Spinal Intervention Society (ISIS) 14th Annual Scientific Meeting: Salt Lake City, UT, 2006. Interventional Techniques Review Course, Memphis, TN, 2006.
International Spinal Intervention Society (ISIS) Phase 4 Discography Workshop, Phoenix, AZ, 2005.
International Spinal Intervention Society (ISIS) 13th Annual Scientific Meeting, NY, 2005. Implantable Pain Therapies Theory and Technique Workshop, Minneapolis, MN, 2005. 22nd Annual Pain Symposium, Lubbock, Texas, 2005. American Society of Interventional Pain Physicians (ASIPP) 7th Annual Meeting April 2005.
International Spinal Intervention Society (ISIS) Interventional Thoracic and Lumbar Workshop, 2004.
International Spinal Intervention Society (ISIS) Interventional Radiofrequency Workshop, 2004.
International Spinal Intervention Society (ISIS) Imaging for the Interventionist, 2004. – How to be a Successful Independent Medical Examiner. – How to be an Effective Medical Witness and Negotiating Skills for Physicians. Innovations in Percutaneous Discectomy, Health Stream, Baltimore, MD, 2003. 16th Annual SPPM Pain Management Symposium, Scottsdale, AZ 2003. Intradiscal Electrothermal Therapy (IDET)/ Electrothermal Disc Decompression, 2003. Arthrocare, Disc Nucleoplasty Coblation Technique, 2002. Occupational Orthopedics and Workers’ Compensation, 2002.
International Spinal Intervention Society (ISIS) 10th Annual Meeting: Disc Guidelines, 2002. American Society of Interventional Pain Physicians (ASIPP) 2nd Semi-Annual Interventional Pain Medicine Meeting, 2002.
International Spinal Intervention Society (ISIS) 9th Annual Scientific Meeting: The Guidelines, 2001.
International Spinal Intervention Society (ISIS) 7th Annual Scientific Meeting, 1999. Medical Acupuncture for Physicians, UCLA, Los Angeles, CA 1998. Non-operative Management of Cervical and Lumbar Disorders, Washington, DC, 1998. New Jersey Society of Physical Medicine and Rehabilitation. New Jersey Society of Interventional Pain Physicians. Society of Practice Pain Management. NJ’s New Opioid Law: What You Need to Know & D0: NY/NJSIPP Pain Medicine Symposium, Jersey City, NJ, October 29, 2017. Return to Work: A Pain Management Perspective: CMSA New Jersey, South Iselin, NJ, March 20, 206; Horizon Casualty, Newark, NJ, February 10, 2016; Morristown, NJ, January 21, 2016; First MCO, Parsippany, NJ, December 8, 2016. Navigating WC/NF: Denials, Appeals, and Peer-to-Peer: NY/NJSIPP Pain Medicine Symposium, Jersey City, NJ, November 7, 2015. Update on Interventional Procedures in Pain Management: When Enough is Enough. Tri-County Orthopedics Workers’ Compensation Seminar, Hillsborough, NJ, October 9, 2015. IROM: Interventional Regenerative Orthopedic Medicine: An Overview: NJSIPP, Edison, NJ, January 14, 2015. Chronic Pain: Implantable Devices: Qualcare, Piscataway, NJ, September 2013. Chronic Pain: Implantable Devices: NJ Manufacturers, West Trenton, April 2013. Current Trends in Interventional Pain Management. 12th Annual Case Manager Education Seminar, PTPM of New Jersey, March 2013. Spotlight on Pain Partnering for Patient Care — Developments in the Treatment of Chronic Pain: Horizon Casualty, Newark, NJ, June 2012. Spotlight on Pain Partnering for Patient Care — Developments in the Treatment of Chronic Pain: New Jersey Manufacturers, Parsippany, NJ, October 2012. Chronic Pain: Implantable Devices. Horizon Workers Compensation, Wall, NJ, July 15, 2009. Return to Work: A Comprehensive Interventional Approach. Horizon Casualty, Newark, NJ 2008. Chronic Pain: Implantable Devices. New jersey Manufacturers-Workers Compensation, Edison, NJ 2008. Interventional Pain Management: Making a Difference in our patients lives: First Presbyterian Church, December 3, 2007. Return to Work: A Comprehensive Interventional Approach: Encompass Insurance, Monmouth Junction, NJ October 17, 2007. Chronic Pain: A Non-surgical Approach: Health and Wealth Forum, Pines Manor, Edison, NJ March 3, 2007. Return to Work: A Comprehensive Interventional Approach: Workers’ Compensation/Case Managers Seminar, Clark NJ, November 2, 2006. Ultram ER (tramadol HCL) Extended-Release tablets: An Innovative Approach to Chronic Pain, Margate City, NJ October 13, 2006. Pain Management: A Comprehensive Interventional Approach, Benitos Restaurant, Rahway Pain Program, Union, NJ. October 12, 2006. Advances in Treating Chronic Pain: Trinitas Hospital, Elizabeth, NJ. September 26, 2006. Treating Patients in Pain: Opioids vs. Interventional vs. Doing Nothing: Grand Rounds Rahway Hospital, Rahway, NJ. June 7, 2006. Neurological Testing and Evaluation in Athletes: Athletic Training Seminar, Kean University, Union, NJ. November 30, 2005. Attacking the Back: An Interventional Approach to Low Back Pain: Advanced Physical Therapy, Cranford, NJ, November 2004. Non Surgical Treatment of the Cervical and Lumbar Spine: Department of Physical Therapy, JFK Medical Center, November 2003.